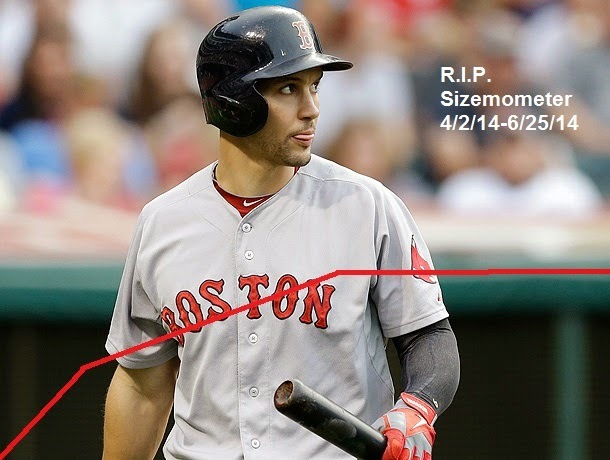 The red line summarizes the path of the "Sizemometer"
Admittedly I stopped tracking Grady Sizemore's fantasy points over a month ago, but his stats basically flatlined in June. For the month he went 4-for-30 with just one RBI, one extra base hit, a .133 average, .212 on-base percentage and a .167 slugging percentage. Last week the Red Sox designated Sizemore for assignment (which means they cut him), and yesterday his Boston career officially came to an end when he signed a minor league contract with the Phillies.